First here’s a little sketch. 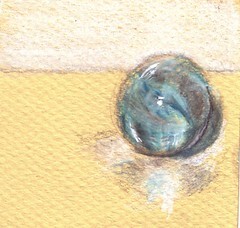 I’ve been drawing marbles this week. I’ve been captivated by glass and reflections, so marbles seemed like a good challenge. For this study, I was able to get a little colored pencil practice in as well. I did use Pro-White on the whitest white reflections on the marble. I like how the cat’s eye is obscured, but still visible. I just got my first tag from Wendy at Quirkyartist. I’m supposed to share five things about myself and then tag five other people. I’ll fulfill the first requirement today and then tag others on my next post. I’m an only child, and extremely introverted. Starting this blog is a way to try to break out of my shell a little. My art education is entirely self-directed. I feel odd saying that I am self-taught because I have had a number of excellent teachers over the past 10 years. I’ve been married to a wonderful guy for 13 years. We’re childless by choice and still loving that decision. I got my driver’s license when I was 33 years old. I’m 40 now. I think that is kind of strange for a U.S. citizen. I never really wanted to learn and I live in a great city with an excellent public transit system and lots of bike routes. I decide d that I would learn to drive because I thought it would be a maturing experience for me. My husband tried to teach me. Bad idea. No reason to tell that story. Anyway I paid for lessons, took the test twice and got my license. Well, once I got home I stuffed that license in my wallet and I never got behind the wheel again. After years of being a passenger I just can’t used to the concentration required to drive. It’s too exhausting. Not only do I not drive, but we even got rid of our car about five or six years ago we realized that we really didn’t really use the car often enough to justifying paying the insurance. We really enjoy walking and we can ride our bicycles when we need to go a distance. So we had Volunteers of America tow our car and they were able to auction it off. Not having a car saves so much money. We are both homebodies so we don’t miss it much. We also have access to a carshare company in town and we can rent a car if we really need to. It’s been wonderful. Walking is great for our health. It’s nice to not have to buy gasoline. I also don’t buy so many impulse items. You are definitely more carefully about your shopping if you know you have to care it for a mile or two. Whew! That was long. Was that more than you needed to know? I will tag five bloggers on my next post. See you all later! I love it when artists share about themselves and I love seeing the connections. The Volunteers of America was the sponsor of the charter school for the arts that Sara and I helped start a few years ago in Rochester, MN. They are still sponsoring the school, the last I heard, and doing a good job. I also love that you can live without a car. I’ve been tempted to live in a big city because of that. Your in Portland, right? I love that city… except for the gray skies. I have a friend who is 36 and does not have his driver’s license. You did it! A very nice assortment of facts, Mellanie. And a beautiful marble, too. I’m proud of you, my friend. Chris, Yeah, I’m in Portland, OR. I’ve lived here most my life and there’s no way I am ever leaving. As for the gray skies, well, there’s plenty of green to make up for that. I like what you said about connections. If you talk long enough with someone there’s always something you have in common. Tara dear, thanks for stopping by again. Your support is treasured. Thanks for being such a great friend. I admire anyone than can paint anything transparent and reflections of light and you do that very well. It’s incredible. Beautifully made. Beautiful drawing, I love how you captured the feeling of a marble. Good for you that you live without a car. That is a great story. It sounds like you have a fine time without it. My friends in Chicago also have access to carshare companies, and got rid of their car. Living in LA, I am in a car more than I would like to be, so your story sounds so lovely to me! I also like it when artists share details about themselves! It’s a way we can get to know each other, as if we were sitting down over a cup of tea. hi Mellanie! how interesting to read all these facts about you. It’s a great idea that of renting a car only when you need it and not having one, that’s cool. Thanks for tagging me (grrrrrr!!!!!) hahaha, give me a couple of days to think of something different than the other time i’d been tagged. Hugs, Martín. This is the first time I’ve discovered other bloggers who do art and talk about it. Thanks for all the great links. There’s a whole community of you out there–people like me–how exciting! I really enjoy your art and will be back for more! anangeli, thanks. It took me a while to get it, but it was worth it. Kris, live without a car is pretty sweet, but I know that it’s impossible in LA. I know one of the things I like about your blog is getting to know you through your stories. I was a bit nervous to reveal myself a little. Then I realized. I’m writing personal blog! Geez girl, get over yourself! Sandy, a big hello you in Lane County. There are so many great art blogs out there and I keep finding more every day. There’s so much creativity and so much beauty out there on the web. I found your blog inspiring. That is a great idea: journaling with colored pencils on black. You and Cheryl sound like amazing women. I’m definitely adding you to my list. Well done! A lot of interesting stuff we learnt about you. I tried without a car in Sydney but found it hard with the groceries etc. Also need a car to get my stiuff to and from the night classes I teach. Wendy: Thanks again for the tag. It was fun to do. Melanie, your marble drawing is beautiful! Great to learn a little more about you too. I’m an only child also and introverted and I’m right there with you about driving. I wish we lived somewhere where a car wasn’t necessary. We used to live in Cincinnati, and didn’t have a car there because, like you, we didn’t need one. But now that we are out here in the wilderness. . .oh well. Ann: Thanks for the compliment. That marble was tough, but I did well with it. That’s so cool that we have so much in common. I love your colored pencil drawings. I am struggling with them right now and it makes me realize how hard it is to get the effect that I enjoy in your flowers and landscapes. Thanks for sharing some facts. I would love to do without the expense of a car but, as yet, I do still find it a necessity. I did go without a car for nearly 2 years when my van was stolen and it was so difficult, particularly when trying to do grocery shopping for a large family. Amy: Thanks for stopping by. Isn’t EDM a blast? I get a bit overwhelmed by all the posts, but I get the digests and scroll through them when I can. I’m so glad you liked the marble. I was so pleased with how it turned out. I still look at it and think, Wow. Serena: I enjoy your blog so much. I love that you stopped by. I know what you mean about the car thing. If we had kids, or even a dog, we would definitely have a car.